Art makes for great stories. Because there’s always a story behind the making of art. In The Muse by Jessie Burton (HarperCollins 2016), there isn’t just one, but two interwinding stories – set 30 years apart – about a mysterious painting. One story is set in a 1960s London art gallery, the other in a beautiful Spanish villa at the outbreak of the Spanish Civil War. Spain, 1936. A Viennese art dealer and and his family have recently arrived at a dreamy villa on the warm southern coast of Spain. Their daughter Olive has just been admitted to the Slade School of Fine Art in London, but doesn’t know how to ask her father for permission to go. He wouldn’t approve. He doesn’t think women should paint. So instead of confronting her parents, Olive sneaks upstairs to the attic in order to paint in secret. Her new canvases are infused with the passion and inspiration she feels for her new home – the heat, the sun, the landscape, the orchards, but especially, the dark, handsome villager named Isaac Robles who has stirred up something new and deep inside her. Isaac is an artist too, but mostly he’s a young revolutionary intent on organizing and agitating for his cause. She never knew she was capable of such work. She had made, for the first time, a picture of such movement and excess and fecundity that she felt almost shocked. Olive hides The Orchard under her bed and works on sketches of her muse Isaac (Isaac Chopping Wood, Isaac with Coffee Cup) until she is inspired to try an even more complicated painting. Isaac and his sister have told Olive about a old Spanish legend in which two sisters, Santa Rufina and Santa Justa, become Christian martyrs. (It’s a real story, but I’d never heard of it before so of course I had to Google it.) Two sisters are persecuted for their Christian beliefs during the Roman Empire. After breaking a pot with a pagan image of Venus, one sister is thrown down a well and the other is thrown to the lions. Somehow, Olive figures out a way to paint it. She calls it Santa Justa in the Well. The new piece was a surreal composition, colorful, disjointed to the gaze. It was a diptych; Santa Justa before her arrest and after, set against a dark indigo sky and a shining field. . . . The left half of the painting was lush and glowing. Olive had used ordinary oils, but had also experimented with gold leaf, which glinted in the light as she held the painting up. . . . In the middle of the healthy land on this left-hand side stood a woman, her hair the color of the crop. She was carrying a heavy pot with deer and rabbits painted on it, and its centre was the face of the goddess Venus. Both the faces of the woman and Venus looked proud, staring out at the viewer. I tried to imagine what this painting might look like. I can definitely see The Orchard in my mind’s eye, but not this one. There’s sky and crops and the full figure of a woman and a pot so detailed you can see the little deer and rabbits and the face of Venus. And then the other side of the diptych it gets even more complicated. On the right half of the painting, the crop was deadened and limp. The woman appeared again, except this time she was curled inside a circle, hovering over the crop. This circle was filled with an internal perspective to make it look as if it had depth, as if the woman was lying at the bottom of a well. Her hair was now severed and dull, her pot had smashed around her, a puzzle impossible for anyone to piece together. Around the rim of the well, full-sized deer and rabbits peered down, as if set free from the broken crockery. Venus had vanished. My goodness, what a difficult project for Olive to take on as a beginning painter. As I say to myself sometimes when I’m struggling with a difficult painting: “maybe you’ve bitten off more than you can chew with this one.” Olive has had no formal training – not that’s the only route to artistic genius, but it sure helps. And how quickly did she paint it? This complicated a composition would take days, weeks, even months. And how did she keep her act of painting so secret? What about the strong smell of oil paint (which her father the art dealer would’ve recognized)? Apparently Olive’s parents were quite distracted during this part of the book. The Muse relies heavily on the myth of original genius. It makes a good story. An untrained but inspired young woman creates a breathtaking piece of art without any training, instruction or advice. It sounds lovely, but I don’t happen to believe in it. That’s not to say the subject would have been impossible to paint. Other famous Spanish artists have taken their turn with the legend of Santa Justa and Santa Rufina, including Valasquez, de Goya and Murillo. Bartolomé Murillo, Santa Justa (c. 1665), oil on canvas, Meadows Museum, Dallas, Texas. In fact, there is an interesting side story about this Murillo painting and its companion piece, Santa Rufino. When the Meadows Museum initiated provenance research in accordance with the recent effort to identify Nazi era looted art, it was discovered that these two paintings had indeed been stolen from the Rothschild family during World War II. The Monuments Men Foundation is currently researching whether or not the paintings had been properly restituted before they were donated to the Meadows Museum. Fortunately, I was able to put aside my misgivings about how Olive’s paintings came to be, because the story soon becomes a fascinating mystery. The Spanish Civil War intervenes with its tales of danger, tragedy, loss and confusion, and we’re not quite sure what’s become of Olive’s secret paintings, much less Olive’s family and friends. The gallery prepares for a show announcing its exciting new discovery and highlighting Isaac Robles’ short but apparently brilliant career. Odelle digs deeper into the painting’s provenance and makes an unlikely ally. As Odelle uncovers the truth behind the painting, she find the inner fuel to pick up her own neglected journals and return to her dreams of becoming a writer. And that, friends, is how you write a terrific book. Art makes for great stories, doesn’t it? Oh, and by the way, the author Jessie Burton has a fabulous Pinterest Board for The Muse. Check it out! The Muse by Jessie Burton. Highly recommended. As readers of this blog know, I’m a little obsessed with art history books, both fiction and nonfiction, and there have been quite a few good ones lately. I just took a stack to my painting class and passed them around. Here’s your chance to find out my recent art history reading recs too. The Last Painting of Sara De Vos by Dominic Smith (Farrar, Straus and Giroux, April, 2016). Haven’t heard of it yet? You will. It was named a New York Times Editor’s Choice, earning this fabulous review from the New York Times. This novel is a mix of your favorite art history novels, but it’s still uniquely its own. It blends themes from The Goldfinch (with fast-paced suspense, a mysterious art theft and its grasp of what power a painting can have over its beholders), The Girl With a Pearl Earring (in its gorgeous, tender depiction of painters in 1600s Holland) and The Art Forger (fascinating passages about forgery techniques; insightful consideration of the psychological effects on an artist who uses her skills to commit artistic fraud). To summarize, an art history grad agrees to “copy” a valuable but lesser known Dutch painting, At the Edge of a Wood by Sara de Vos (an imaginary painting by a real artist), knowing full well that it is probably going to be used as a forgery. The original is stolen and replaced with the copy. Decades pass. The art forger is now a respected curator and art historian specializing in female Dutch painters of the Golden Age, and when she mounts an exhibition, both the original and her forged copy of At the Edge of a Wood arrive on loan to the art museum. Which one is real? How can you tell? Will the curator’s shameful secret be revealed and her career destroyed? And what about the woman who painted it so many centuries ago? I especially appreciated the author’s enlightened approach to the psychological evolution of the female characters. (Is it relevant that the author is a man? Does that make it more of a writerly/moral accomplishment — or is that lowering the bar for men? Discuss amongst yourselves.) Too often in historical fiction, whether the author is male or female, women become powerless pawns in service of plot, or victims of gender-based restrictions. While it might be true to the period, it can make for dull, uninspired reading. And yet, to give a historical female character too much agency can feel false and anachronistic. In The Last Painting of Sara De Vos, Dominic Smith manages to capture the truth of the historical era without sacrificing the depth of female character development. Seriously, I almost stood up and cheered at the end when I learned the full story of the last painting of Sara De Vos. So bravo to the author for pulling that off. I just burned through The Improbability of Love by Hannah Rothschild (Knopf, November 2015). I just love the U.S. cover — very clever turning palette into a heart, don’t you think? I’m pleased to recommend it as another suspenseful art history novel. Once again we have an imaginary painting (“The Improbability of Love“) by a real artist, this time a French Rococo painter from the 1700s, Antoine Watteau. Check out the author’s website where she answers the question, Why Watteau? A young chef named Annie McDee stumbles upon the painting in a second-hand shop where no one knows its true value. Annie buys is for a song, and then curious, begins to research its provenance. I knew I’d be rescued but never thought it would take fifty years. There should have been search parties, battalions and legions. Why? Because I am priceless and I am also the masterpiece that launched a whole artistic genre. And if that isn’t enough, I am considered to be the greatest, the most moving, and the most thrilling representation of love. Imagine being stuffed away in a bric-a-brac shop in the company of a lot of rattan furniture, cheap china and reproduction pictures. I would not call myself a snob but there are limits. In addition to the droll little quips from the painting, you have Russian oligarchs, greedy art dealers, clueless art experts and a Nazi art hoarder who has tried to cover up his past. Not all of these elements work, and some of the characters just clutter up the less-than-perfect plot. Nevertheless, I truly enjoyed the passages about the cleaning and restoration of the painting as well as the research into its provenance. 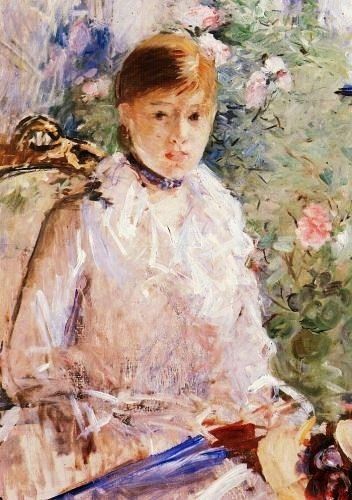 The plot is suspenseful, and you’re never sure whether Annie will be able to keep the painting safe from the many interested parties who would do anything, pay anything, to lay claim to it. Another art history novel I’m really excited about is Georgia, A Novel of Georgia O’Keefe by Dawn Tripp. I am hoping my Chicago book club will read it this summer, paired with a visit to O’Keefe’s work at the Art Institute of Chicago. We all know Georgia O’Keefe from her later years as a painter of the Southwest. Maybe you’ve even been to the Georgia O’Keefe Museum in Santa Fe. I knew that O’Keefe was born in Wisconsin and studied at the Art Institute of Chicago, but then what? Hmmm, wasn’t there something about an affair with a New York photographer? This story is about a woman’s fight to create and retain her own artistic identity. Stieglitz wants to control her but she’ll have none of it, even after their marriage. O’Keefe fiercely guards her independence and insists having “a room of her own.” (The key to any artist’s happiness, right?) In the end, O’Keefe’s “room of her own” was her home and studio in Santa Fe, New Mexico, where she spent over 50 years of her life. In charge of her own life and art. The author’s website is worth a visit if you’re interested in learning more about Georgia O’Keefe, including a fabulous Book Club Kit I plan to use myself. I just finished The Rivals of Versailles by Sally Christie (as well as the first book in the Versailles series, The Sisters of Versailles) and I’ve just got to share them with you. My book club is going to love them. Who can resist historical fiction from the “other woman’s” point of view? I literally burned through both books and still feel like I’m sneaking through the secret halls and corridors of Versailles. The Rivals of Versailles is about King Louis XV’s mistress Madame de Pompadour. When I lived in France, I heard a lot about her but never knew her story. I was surprised how much the French knew about her (so American of me — shocked at the lack of French shame about affairs and mistresses). I enjoyed the book so much I reached out to Sally Christie and she was generous enough to answer my questions. Margie: How much time did you spend researching in Versailles, and how did it inform your writing? Sally: I’ve made two research trips to Versailles and both times spent about a week there, staying in the town of Versailles (the palace is literally in the town). The town is almost as interesting as the palace itself, and dates from the 17th century as well. Many of the high nobles that had apartments in the palace (a sign of great prestige) also had houses in town, for their overflow of servants, clothes and horses. Those research trips were absolutely critical for capturing the sensory details and imagining how the sisters lived. Seeing the reality of their lives, standing at the same windows and looking out over the same gardens, walking through the stables and kennels and gardens made imagining the scenes of their lives so much easier. Margie: If you were a tour guide at Versailles and in charge of an exciting new tour called “The Mistresses of Versailles Tour,” (sign me up!) where would you take us? Can we see any of the back staircases, hallways and little attic apartments in the book? Sally: That tour already exists! I was fortunate on my first trip to be able to take a backstage tour that took us to the apartments of the Marquise de Pompadour (which were previously Marie Anne de Nesle’s apartment) and then also to the apartment of the Comtesse du Barry (Louis XV’s final mistress and the subject of my third book, The Enemies of Versailles). Wow – it was simply amazing. The tour is very expensive and before doing it, I was skeptical that it would be worth it, but after I did it – no doubt. It was so fascinating to get out of the magnificent state rooms (which quite frankly I find rather boring and overwhelming) and leave the crowds behind. Take back staircases, walk along narrow corridors, experience the smaller, more intimate apartments and see some of the servants’ cubby holes that give a real sense of the “rats nest” that the majority of the palace was away from the public rooms. Now what I wish there was is a “Versailles Carte Blanche” tour which would allow you access to EVERYWHERE in the palace. Only such a small portion is open to visitors, and every time I go there I find myself looking longingly at the windows of all the other apartments that are off limits to the public, wondering what’s behind the scenes…. Margie: Where can we see artifacts from the Marquise’s era with Louis XV? I seem to recall seeing some Louis XV antiques with fish decorations on them, and now I wish I had known more at the time. Does the Museum of Decorative Arts in the Louvre have some? Sally: Versailles is quite empty of furniture and is only furnished with pieces that can be authentically traced to the palace. The palace administration spends enormous amounts of money to acquire authentic pieces – think millions for a sofa! The Museum of Decorative Arts in the Louvre has several items of Madame de Pompadour’s, and of course many, many contemporary items from her era – she was hugely influential in the decorative arts and was a keen supporter. I think it’s really interesting how timeless Pompadour’s 18th century interior design esthetic is. We would feel perfectly at home in it, and it is still a desirable “look” for a house: really the epitome of class, sophistication and elegance. The Musee Cognacq Jay and the Musee Jacquemart Andre are two excellent museums with lots of 18th century furniture and art. A day trip to the factory at Sevres is fascinating, and it has a great collection of pieces developed under Pompadour’s patronage. The Biblioteque Nationale has her engraved gem collection – it’s quite impressive and well worth a visit. If you’ve read The Rivals of Versailles, you’ll know the significance of the gem engraving for her and Louis! Thank you so much, Sally for the interview! If you’d like to read more and see photos of the places and scenes in the book, be sure to visit Sally’s website, which is a treasure trove of information. Check out her fabulous photos here. Thank you also to Emma of France Book Tours for arranging this blog tour. Such a treat to read the Rivals of Versailles before it was released. Lucky me! Do you remember h earing about the 2012 raid on the small Munich apartment that uncovered over 1,200 works of Nazi-era looted art? In this book, Hitler’s Art Thief, Susan Ronald tells the whole unbelievable story of the men behind the stash: Cornelius Gurlitt, the 80-something owner of the apartment, and his father Hildebrand Gurlitt, a Nazi-era German dealer of modern art. This book is perfect for fans of the Monuments Men who wish for a deeper understanding of exactly how Nazi looting took place and why restitution remains so difficult. In particular, this book tries to explain what happened to the “Degenerate Art” which Hitler didn’t want, but was happy to profit from. It is a disturbing story with Hildebrand Gurlitt in the deep dark center, playing off both sides at once. 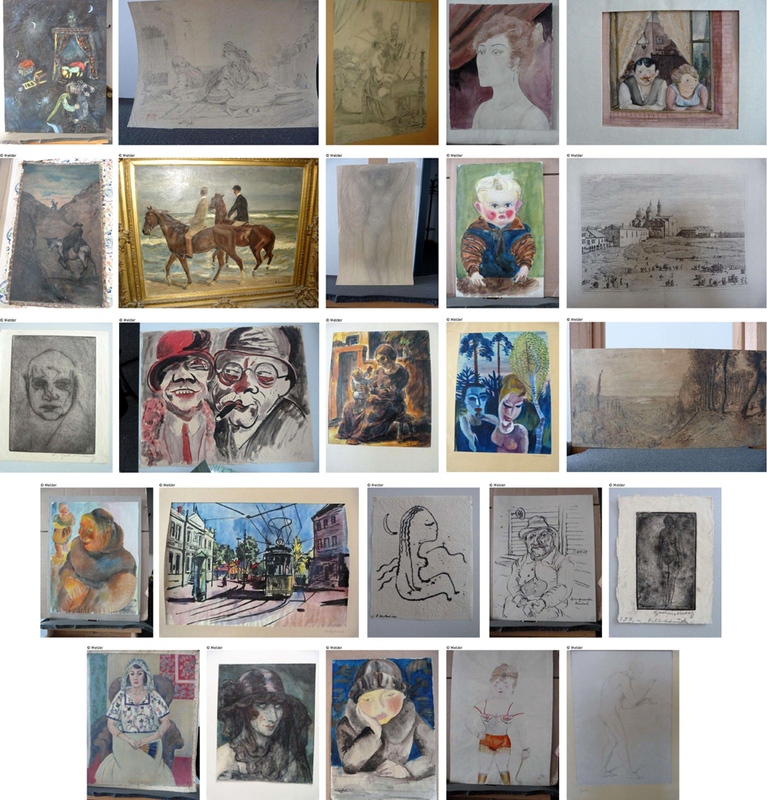 A photograph of some the Gurlitt Collection supplied by the German prosecutor’s office to help identify potential claimants. For more information go to http://www.lostart.de. But let’s fast forward to the present for an update to the latest news about the Gurlitt stash. You might have heard that when Cornelius Gurlitt passed away in May, 2014, his will donated the entire “Gurlitt Collection” to the Kunst Museum of Bern, Switzerland. Interesting that Gurlitt did not choose a German museum, isn’t it? Before his death, Gurlitt had lawyered up and was fighting the German government, objecting to their warrantless search and seizure and demands for restitution. 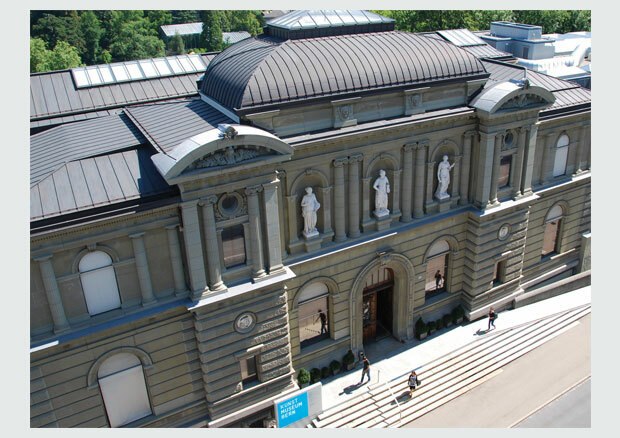 The Kunst Museum of Bern played hot potato, denying any prior relation with Gurlitt and hiring lawyers of its own. It took several months before the museum finally agreed to accept only those paintings that had not been looted. The looted art would remain in Germany pending a lost art claims procedure. Since then, a further wrinkle has developed. Although Cornelius Gurlitt never married and had no children, there are two surviving cousins – Uta Werner and her brother Dietrich Gurlitt – who have filed a legal challenge to the will. The Kunst Museum has said the donation is on hold pending the outcome of the matter in German probate court. As of October, 2015, the appellate court is considering a report by an independent psychologist regarding Gurlitt’s mental capacity to execute the will. Either way the court decides, it appears that looted art in the Gurlitt collection will be available for restitution. Both the heirs and the museum have agreed to cooperate with efforts to locate the proper owners of the looted art. The problem is, how do you know what’s looted if there aren’t good records? If the records are themselves fraudulent, missing or destroyed? And most tragically, when the original owners were murdered and the heirs don’t know or can’t prove what paintings are rightfully theirs? In many cases, Hildebrant Gurlitt bartered and traded “degenerate art” for traditional art designated for Hitler’s Fühermuseum in Linz, Austria, but sometimes he just sold it on his own account for his own personal profit, making it all more difficult to track. Sometimes Gurlitt just held onto it and hung it on his own walls. After the war, Gurlitt tried to sell some of the art for personal profit, but found it more and more difficult to explain their provenance or to find a way to launder them. So when Hildebrandt died in 1958, his son inherited the stash. Apparently, Cornelius couldn’t figure out how to sell it off either. And so it sat until 2012. Out of the 1,407 pieces of artwork discovered in the Munich apartment, and another 60-plus in two different homes that Cornelius Gurlitt owned in Salzburg, Austria, there are about 970 artworks under provenance investigation. According to the Lost Art Internet Database, the Task Force has categorized about 380 of them as “degenerate art,” which were for the most part confiscated from public collections and museums. The Task Force is investigating another 590 works for evidence of Nazi-era looting. Although this Task Force was formed in 2013, only four pieces of art in the Gurlitt Collection have been identified as looted and only two have been returned to their lawful owners. One of these is Max Liebermann’s Two Riders on the Beach (1901). 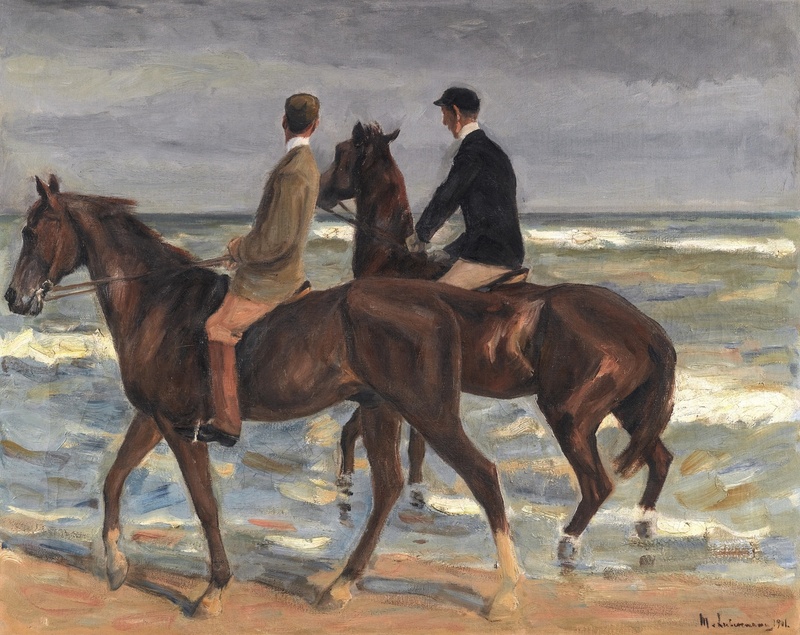 Max Liebermann, Two Riders on a Beach (1901), part of the “Gurlitt Art Trove.” The Gurlitt Estate Task Force returned this painting to the heirs of its original owner, a Jewish art collector in Germany. The heirs sold it in in June, 2015 for approximately $2.8 million at a Sotheby’s auction in London. When the news broke about the Gurlitt treasure trove, a 90 year-old New York attorney named David Toren recognized Two Riders on a Beach from his childhood. He could recall seeing it at his uncle’s estate in Germany just before the war. Although most of Toren’s relatives died in the holocaust, Toren survived because he had been sent on a Kindetransport to Sweden in 1939. Torn submitted a claim the Gurlitt Task Force but encountered so many delays that he filed suit in 2014. In May, 2015, the Task Force finally agreed to grant Toren’s demand for restitution. They confirmed that the Nazis had forced the sale of Toren’s uncle’s German estate (along with Two Riders on a Beach which hung inside) to a Nazi General who planned to use the lodge as his retreat during the upcoming invasion of Poland. The painting would have been considered “degenerate art” and thus ended up in the hands of the modern art dealer Hildebrand Gurlitt. Gurlitt was supposed to find a buyer and to sell it on behalf of the Third Reich, but ended up keeping it for the rest of his life. To learn even more behind the true story of this and the hundreds of Gurlitt’s other stolen works of art, you’ll have to read the book in its entirety. It’s a fascinating book, but sadly, the story is not nearly over. It is likely there is even more of Gurlitt’s looted art collection stashed away in secret places.